Super Hero Boy: Something red for valentines day! Something red for valentines day! I've been a big advocate for Boon products from the beginning. Actually ironically enough one of my very first reviews of last year was the Boon Frog Pod which is still an household staple here. It along with several other boon products including our Boon Modware and Boon Snack Ball are high on the list of items we could not imagine our life without. So when the new Boon Bug Pod came out I was beyond exciting. Not only does this new bath toy organizer introduce some new style into Boon's very modern look but some new colors as well! The Boon Bug Pod is very similar to the Boon Frog Pod in function but its most obvious difference is in the looks and profile of the Bug Pod. If you have always wanted a Frog Pod but were concerned that it may be too big for your bath space you may really appreciate the fact that the Bug Pod though it has the same features and stores the same amount of toys its quite a bit more narrow than the Frog Pod so it fits neater in smaller spaces. Though this may not seem like much but if your like me and have a small bathroom or have storage shelves in your bath its not nearly so overwhelming to the space. The best part about the Bug Pod is just the fact that its one of those products that functions exactly how its supposed to and it fills a real need when it comes to children's toys and bath products. My Frog Pod has been in my bathroom for almost a year at this point only using suction cups to hold it up. In that year its withstood countless showers, Connor's abuses, being cleaned over and over with mildew cleaners as my bathroom does not get enough ventilation so I must spray everything for mildew more often than I would like... and still in that entire year it has only come down once. Partially it was my fault as I left cleaner to sit and it got behind one of the suction cups and let the whole thing slide down. Easy enough I just let the wall dry nice again and cleaned all the suction cups and put it back up and almost four months later there have been no more occurrences. Any other time we have used suction cups in the bathroom its a total battle keeping them stuck to the wall. Though both the Frog Pod and the Bug Pod both come with both suction cups and sticky tape and even the ability to screw them into the wall why put holes in the wall if the suction cups work? 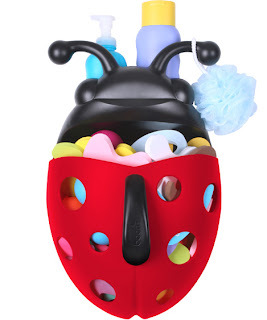 Though I have to say the new bright red ladybug shaped Boon Bug Pod may just be the most attractive Boon design yet. The bright red and its attractive almost feminine slim design is really quite pretty and though its perfect for both a boy and a girl it certainly yields itself to a girls bathroom more than a frog does. You can buy your own Boon Bug Pod at the Boon website! I HIGHLY recommend them!